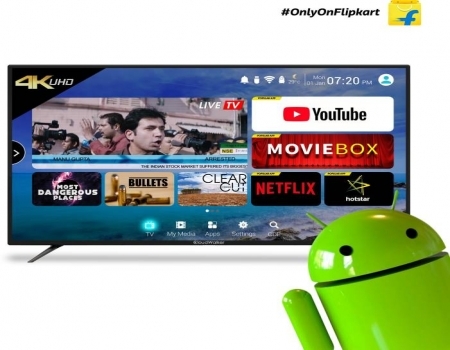 Flipkart is launching new Smart LED TV for you Cloudwalker Smart LED TV, here Flipkart has launched CloudWalker Full HD Smart LED TV with price starting at Rs. 11,990 along with extra offers. It is similar to Chromecast, so you just need to plug the stick into the HDMI port into your TV and power it using the micro USB on your TV or a wall charger. Important Note: To avoid any physical damage to the product while unboxing, please ensure that only an authorised Flipkart delivery/service executive or brand personnel opens the packaging. Product Description: You know you are in for a good time when you watch movies or listen to music on this CloudWalker Ultra HD LED smart TV (139 cm). Packed with an array of innovative features, this TV enhances your viewing experience by bringing you clear, sharp and detailed content. The great picture quality is backed up by this TV’s 4K UHD resolution. Add CloudWalker CloudTV (55 inch) Ultra HD (4K) LED Smart TV to your cart. Make Payment of Rs 35,999 only.